Frankly, I have no idea what to call this dish. It was a “this sound good with x,y, and z and OH we have this” concoction. I made most of the veggies beforehand since we were going to the gym later in the evening after work and then added the garbanzo beans and spinach and warmed it through. 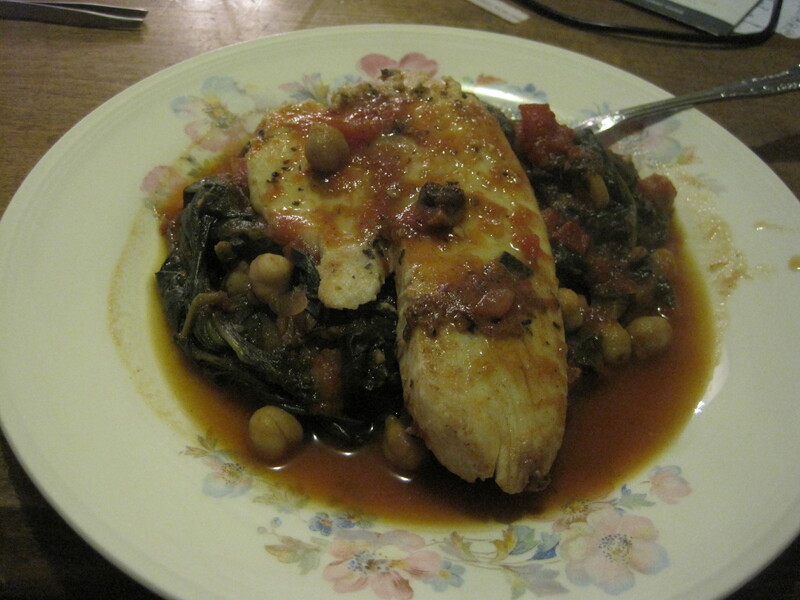 I think that method worked out really well because the chickpeas didn’t get really mushy. The veggies actually ended up being very good PointsPlus wise; the only things that were really adding points to the overall meal were the chickpeas and the crushed tomatoes (which was very low). In terms of adjustments, I can’t quite put my finger on it but the veggies were lacking something and the tilapia definitely needed to be more flavorful. The first adjustment that I will make in the future is to add more salt to the veggie mixture. Second, I think I will add some Parmesan or another type of hard cheese to the mixture to give it more of that flavor since the veggies by themselves add very little. The tilapia was very lightly flavored and in the future I think i might have cooked that will some of the tomato sauce or at least created more of a marinade. I think, based on the dish itself, the marinade cannot be too overpowering so perhaps something more like an herb crusting and then searing the tilapia. Enjoy! For the tilapia, I just added some garlic powder and basil and seared them in a pan with some cooking spray. I estimated that a fillet was about 1/8 lb. which was 1 PointPlus. I also used some “I can’t believe it’s not butter!” spray on the fillets so that they didn’t stick to the pan. In a medium saucepan, coat the bottom with cooking spray. Add onions and garlic and cook on medium until onions are translucent. Make sure to be careful not to burn the garlic. Once onions are translucent add mushrooms and toss with onion and garlic mixture. Add salt. Let cook for approximately 3 minutes then add tomatoes and crushed tomatoes (approximately 1 1/2 C). Let cook for approximately 30-40 minutes to let vegetables soften to create more of a tomato sauce that a chunky vegetable stew. Before serving, add can of chick peas (drained) and spinach. Cook until spinach is wilted and well integrated into the vegetable mixture. Serve under tilapia.